Amgen’s cholesterol drug Repatha has a new use in Europe, as the company continues in its battle with Sanofi/Regeneron’s rival therapy, Praluent. 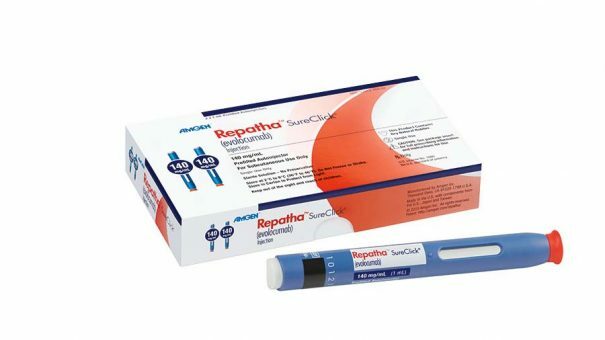 A PCSK9 inhibitor class drug, Repatha (evolocumab) is used to reduce low-density lipoprotein (LDL) cholesterol in patients with primary hypercholesterolaemia, or mixed dyslpidaemia, who have not responded to statin therapy. But the new licence allows it to be used in patients who have already had a heart attack, stroke, or have peripheral arterial disease, to reduce cardiovascular risk. Amgen is facing tough competition from Praluent (alirocumab), which like Repatha was FDA-approved in mid-2015. Sanofi and Regeneron announced data from the large ODYSSEY OUTCOMES trial showing their drug not only reduced likelihood of cardiovascular events in high-risk patients, but also cut all-cause mortality. Amgen’s FOURIER outcomes data demonstrates a link between lowering LDL-C and a reduced risk in further cardiovascular events in patients with established disease where statins have failed to adequately lower cholesterol to target levels. But Amgen does not have the data to show a reduction in all-cause mortality like Sanofi. Although Amgen managed to get its data published ahead of Sanofi, the fact it showed no reduction in mortality led to criticisms that the US company had taken a short-term approach to research. Amgen’s data was gathered over two years, perhaps not long enough to allow any mortality benefits to become apparent, while Sanofi’s longer trial where patients received the therapy for at least two years always had a better chance of showing any mortality benefits. The European Commission’s decision follows a similar ruling by the FDA, which backed Repatha for heart attack and stroke in December. Neither drug has lived up to expectations commercially – Amgen is marginally ahead in sales, with Repatha bringing in $84 million during Q1, compared with around $58 million for Praluent. But this may well change – Sanofi is cutting the price of Praluent in the US to try and gain market share from Amgen this year. Amgen has had the advantage so far in the PCSK9 market, at one point almost getting Praluent banned in the US in a patent infringement case. But despite the new indication, Sanofi’s price cut and mortality data could win over prescribers.